1957 CEYLON - BRITISH COMMONWEALTH - 5 Rupie argento 925/°°° Gr. 28,26 - diametro mm. 39 " 2500 anni del Buddismo" (Cat. World Coins KM# 126) splendida concervazione SPL/FDC. 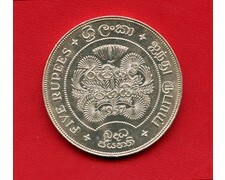 1957 CEYLON - BRITISH COMMONWEALTH - 5 Rupees 925 / °°° Gr. 28,26 - mm diameter. 39 "2500 years of Buddhism" (Cat. World Coins KM # 126) beautiful conservation SPL / FDC.